The script shown below will output all CAN bus messages received on CAN channel 1 to the RaceCapture/Pro log window. This is useful for seeing raw data from the CAN bus and can serve as a general diagnostic aid. Note: Ensure any existing script is erased before copying in this logger script. It's a good idea to also set the same baud rate in the CAN Bus configuration view. Click the write configuration button (down arrow button on left) to write the script to RaceCapture/Pro. Check the check box to poll the log file. This will cause messages from the script to show up in the bottom window. Click the circular-arrow button to re-load the script. If RaceCapture/Pro is receiving CAN bus messages, you will see them in the window below the script. Baud rate is incorrect. Determine the correct baud rate for the BUS and try agian. Bus termination is incorrect. RaceCapture/Pro has built in CAN bus termination. Ensure your CAN bus is balanced with terminators on each end. Interference / poor wire connection. Try shortening the wire or checking the connections. Incorrect Wiring for CAN bus connections. See the Quick Reference for the pinout for the CAN bus connections. Ensure you're connected to the CAN bus used in the script (CAN 1 is the default for the script). Reversed CAN High and CAN Low wiring. Re-check the wiring. 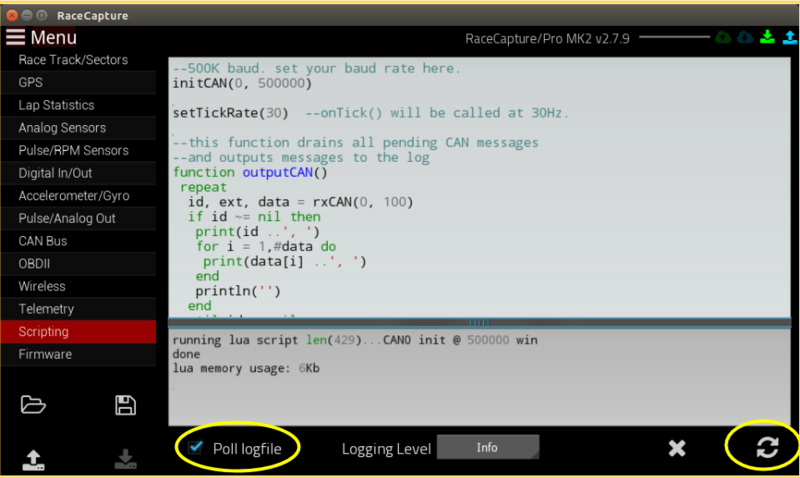 To gather large amounts of data, we recommend connecting directly to RaceCapture/Pro's serial console using a terminal program like Hyperterminal, RealTerm, minicom or similar. Connect to the RaceCapture device using HyperTerminal, RealTerm or Minicom using the COM port assigned by the operating system. View the log by issuing the command 'viewLog' at the serial console. You will see a dump of the CAN bus data to the screen.